A great night of fights at the Heart of St. Charles. While the card might have been short on experience, there was no shortage of action. Of the 10 fights on the card, only three went to decision the rest ending before the first bell. SFL owner Jim Jenkins echoed this sentiment. "The fights were great, I'm really excited about the finals. Those were really high level fights at the end, you could tell. The beginning of the card was pretty green. Those guys need a chance to start, but you could really tell the difference when it got to those two fights. Really impressed with Aaron Brown stepping in on a couple hours notice." In the main event, Jason Slattery took on Gary Roades for a spot in the finals of the Gateway to the Top Tournament. The finals will be held inside the Ameristar Casino on May 18th as part of a Pro/Am show. This fight ended quickly as Slattery attempted three different submissions before finding a win with the gullotine. After the fight, Slattery had this to say on the finish: "Kind of a sloppy take down, but he had his head down and I caught him in a guillotine and it was over." With a barrage of submission attempts, it was apparent that Slattery went into this fight looking to grapple. "Its more my style to just take what I can get. If I see an opportunity I just advance on it. First chance with that triangle I locked it up tight, he got out of that one. I knew my ground game was pretty good so I took advantage of what I could." With the first round behind him Slattery is already thinking of about his match-up with Osmoe "Going to be a good fight. Adam has a good style, pretty dominant wrestler, kind of a problem of mine but I've been working on that a lot. I have a lot of great guys that are good wrestlers that train with me. Going to be a hell of a show." In the other tournament match of the night, Adam Osmoe took on a very game Aaron Brown. Brown took the fight on very shot notice only finding out his training partner Jake Duff was unable to compete two hours before bell time. Osmoe and Brown battled for all three of the four minute rounds with Osmoe getting the nod from the judges. Brown showed the signature iron will that has become the trademark of the fighters from Granite City's CMMA. Osmoe dominated the first round. He quickly closed the distance on his opponent and landed a huge slam to take side control. Brown attempted submissions but only ended up taking punishment from Osmoe's ground and pound. In the second Osmoe began to slow a bit. He was able to punctuate the round with another big slam that saw him get a full mount. About halfway through the second Osmoe caught a knee from Brown and that's when the fight began to turn. The third round was all Brown as he attempted many submissions, even locking on a reverse triangle at one point. In the end the judges declared Osmoe the winner. Catching up with Osmoe after his victory, and he had this to say: "My cardio was kind of bad. It wasn't where I wanted it to be. He's a tough kid, I'm not taking anything away from him. I think the fight could have gone either way." Jenkins spoke briefly about the finals match-up: "Osmoe and Slattery is going to be an exciting fight. Jiu Jitsu vs Wrestling looks like to me." The under card saw Tim Gilstrap battle Trevon Crawford to a decision. Gilstrap won a very even first round, slightly edging out his opponent. Berger's MMA product, Gilstrap worked submissions in the second nearly ending the fight with a standing guillotine choke. The third also was very close. Gilstrap ate some punches closing the distance trying to get the fight to the ground. Crawford seemed to have gotten a second wind in the third and was able to control a large part of the round from top. Having won the first two rounds was enough to secure Gilstrap the win. Scott Schel defeated Brian Davis with a neck crank. 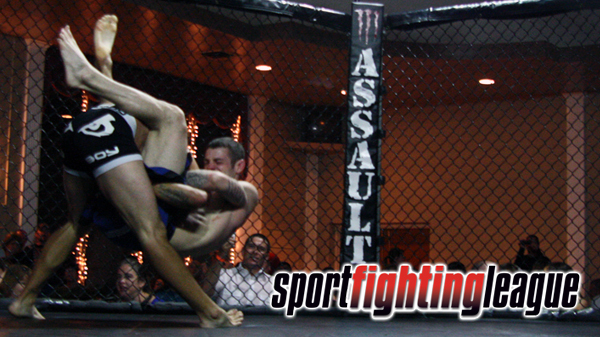 Billy Kreup won by armbar in the first, and Levi Litnen used a rear naked choke to put away Aared Johnston. Also winning on the preliminary card were Lucas McClain, Antion Johnston, Mike Weizel, and John Theis. Adam Osmoe def Aaron Brown - Unanimous Dec.
Tim Gilstrap def Trevon Crawford - Unanimous Dec.
Antion Johnston def Mike Olivent - Unanimous Dec.